Language Unlocked is a consultancy based in the Institute for Applied Linguistics at the University of Huddersfield. Our expert staff are professional linguists engaged in high-level academic and applied research into the nature and use of language. 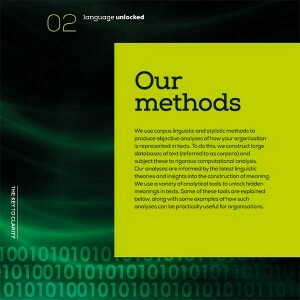 We specialise in the analysis of large quantities of language data for public, private and third- sector organisations. Using sophisticated linguistic tools and software, we are able to reveal textual meanings which are not immediately obvious but which influence how people perceive and respond to organisations and their concerns. Improve the focus and effectiveness of their communication. Understand how their enterprise is perceived by stakeholders. Respond effectively to exterior representations of their organisation’s concerns. Lesley is Professor of English Language and Director of the Stylistics Research Centre at the University of Huddersfield. She is the author of many books on linguistics and stylistics, including Critical Stylistics (Palgrave 2010), Opposition in Discourse (Continuum 2009), Discovering Language (Palgrave, 2006) and Meaning in Interaction (Palgrave 1998). Her expertise is in the field of qualitative and quantitative critical discourse analysis and corpus studies. Lesley co-edits (with Dan McIntyre) the book series Perspectives on the English Language (Palgrave) and is a former Chair of the international Poetics and Linguistics Association. Dan is Professor of English Language and Linguistics at the University of Huddersfield. He is the author and editor of numerous books including Stylistics (Cambridge University Press, 2010; co-written with Lesley Jeffries), Language and Style (Palgrave, 2010), History of English (Routledge, 2009) and Stylistics and Social Cognition (Rodopi, 2007). He has specific expertise in corpus-based stylistic analysis and the development of real-world applications for linguistic research. He edits the book series Advances in Stylistics for Bloomsbury and is Assistant Reviews Editor for the journal Language and Literature. Louise is Lecturer in Stylistics at the University of Huddersfield and has particular interests in cognitive linguistic analysis. Her publications include the co-edited book Cognitive Grammar in Literature (John Benjamins, 2014). Hazel is Research Information and Communications Officer in the Institute for Applied Linguistics at the University of Huddersfield and Project Coordinator for Language Unlocked. She has particular expertise in stylistics, pragmatics and critical discourse analysis. Brian is a Visiting Research Fellow in Corpus Linguistics at the University of Huddersfield. He has published widely on stylistics and historical linguistics and has led workshops worldwide on using corpus methods in language analysis. His background is in computer systems support and he has substantial experience of managing large-scale corpus linguistic projects.